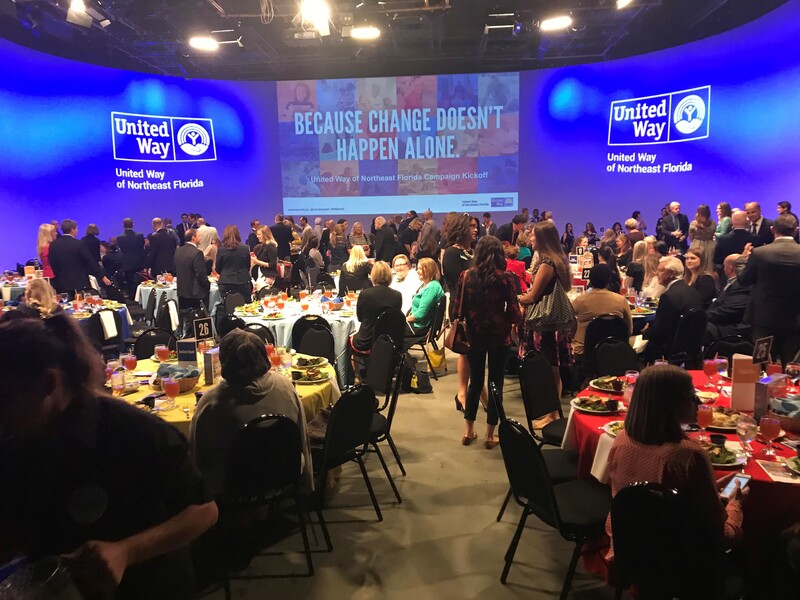 The event, United Way’s annual kickoff, included stories from United Way funded partners and clients they served and centered around a puzzle theme, which symbolizes the many pieces it takes to solves our community’s toughest challenges. George Scanlon — United Way trustee, Finance Committee member and long-time Tocqueville Society donor — was introduced by Geraghty as United Way of Northeast Florida’s 2017 campaign chair. Guests heard several stories from clients of United Way and the services their partners provide. Angela Boyd spoke about how United Way and partners helped Boyd and her daughters get back on their feet following an injury. Hope Barbari, a single mother of five children, spoke about Full Service Schools and Hubbard House’s life-changing counseling and other critical services her family received after they fled an abusive home. Molly Madrey shared her heart-wrenching story of her battle with breast cancer. United-Way-funded We Care Jacksonville provided her access to free treatment. Following each success story, a partner who supported their success also spoke about how United Way is essential to their organization. In addition to these stories, Michelle Braun, president and CEO of United Way of Northeast Florida, presented the annual Sherwood Smith Awards, which honor longtime United Way community leader Sherwood H. Smith. The awards are made possible by a legacy endowment gift from his son, Sherwood H. Smith, Jr. and family. The first award was presented to Judy Hicks of ReMax Realty, a 15-year volunteer fundraiser and champion at Daniel known for her exemplary service in working with children and youth. The second award was presented to Rebecca Aleman, director for disabilities services at Catholic Charities Jacksonville and a community advocate whose efforts have resulted in positive change in policies or conditions that impact the well-being of children and youth in Northeast Florida. The event concluded with United Way leaders sharing a strong call to action. For more information on United Way of Northeast Florida, visit unitedwaynefl.org. If you know a company that might be interested in running a United Way campaign, email Annie Tutt, head of corporate engagement at anniet@nulluwnefl.org.